This was written by Sir Tanaka Reiko in response to requests the Gazette has received for an article on how to start in rattan fighting. The Gazette thanks him for writing the article. You watched fighting for some time now, and you’ve been amazed at the feats of arms and honor. So much so that there’s a little voice inside you saying, “do it….just do it.” Well, you should just do it. Immerse yourself in the game; try something to give you a better perspective on another aspect of this thing of ours. Pick up the gauntlet and accept your challenge. First and foremost this activity is FUN! From the physical elation to the psychological uplift to the adrenalized kick in the pants, fighting will be exciting and enjoyable to the individual who can overcome themselves. We’re all different, how we react to the elicitation of our “fight or flight” instinct will determine how much fun this game is for you. Some love the competition, or the camaraderie. The shared challenge will bring you closer to others and yourself. The way to start in Heavy Combat is find a practice that is relatively close to you. I say relatively because not all local groups have heavy weapon practices. Take a look at your Kingdom’s website and locate where your home group is. Contact the group’s seneschal and ask if they have a local practice when and where it may be. The local seneschal may or may not put you in contact with their Knight Marshal. He’s the officer in charge of running practice and teaching new fighters. He will advise you to the particulars of practice–the where, when, how of it–and will be in charge of showing you the basics and the ropes of what you’re doing. 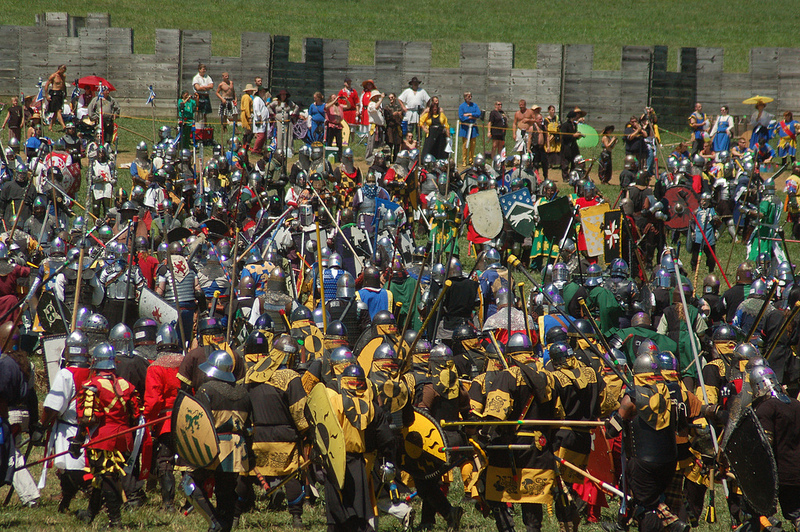 SCA combat is real conflict. Nothing is choreographed. The blows are meant with murderous intent. There are no weight classes or gender classes. You’re a fighter. This is daunting to some and liberating to others. If you expect to have the game dumbed down for you, please find something else to do. New fighters have to learn not only how to move in armor, but move in ways that their bodies aren’t accustomed to. The loading on your limbs is significant and constant. You need to be aware of this going in. You will be struck. You will be hit. The blows will be hard. That is part of the game. We teach you how to calibrate the blows you are receiving. By the rules a “telling blow” is one that would have defeated the armor standard. The armor standard is a chain mail hauberk over a padded gambeson, with an open faced helm. A safety assumption in our game is impervious hand and knee armor. This all translates to being struck with force. The majority of armor will protect you from injury, but you may likely be bruised. It happens. “Rough game Quidditch”. As you may or may not know there are two forms of Heavy Weapons List combat; The Tourney (one on one) and Melee (team on team). As a new fighter you’ll typically train in one-on-one combat to start with learning and drilling the basics. There are also multiple weapon forms that you can train in. Weapon and shield can be single handed weapon in concert with a shield, usually sword and shield but often mace or ax and shield. Two weapon which can be two swords, two maces, or two axes or any combination of them. Polearm or halberd is a bladed weapon on a pole between 4 feet and 7.5 feet in length. Two handed sword or greatsword is any sword that is wielded with two hands. Spear, which is a “thrust-only” weapon, is usually only a melee weapon. Last but not least is combat archery, which can be either a hand bow (that is a longbow or recurve bow) or a cross bow. Combat archery is a melee only weapon form. The majority of weapons are made of rattan, which looks like bamboo but is actually a member of the Palm family. It’s lightweight, strong, and flexes under stress. As it wears the fibers come apart and rarely fails catastrophically. If it does break, it does so without jagged or pointed edges unlike hardwoods. Spears most often are made of a protruded fiberglass haft with a padded tip. Sometimes they’re made of rattan, but those spears flex a great deal. So you show up at a practice and a knight marshal or his/her designate takes you and shows you how to do footwork, shield work, and how to throw shots with a broadsword. You don’t HAVE to start with sword and shield, but it is the best combination of offense and defense in our game. They may or may not put you in armor right away. It’s a judgment call base on how you’re doing. As mentioned you will get hit. I suggest you get it over with early so you’re not wasting your time or money. In our game only “telling blows” count. There will be times when you’re struck or throw a blow that just isn’t good. It’s the nature of the game. Armor does defend you. So you have to hit people with significant force. You will train up to it. We do not fight with “light sabers”. You have to hit people with force. There are times you will be hit and you will be bruised. Yes, you will be hit that hard. If you don’t want to bruise, don’t play this game. Even the best get hit with murderous intent; in the beginning everybody gets hit. If you go in with excitement and a sense of adventure, it will mitigate the fear of being struck. You’ll have fun. In the beginning you’re going to be loaned armor. Sometimes a local group has loaner armor, many times it will be off the body of another fighter. This is a rite of passage in the SCA. Expect that you’ll be hot swapping armor. Fighting is a hot sweaty affair; you’ll sweat just standing in the armor. Once you start fighting you’ll be sweating like digging ditches in Georgia in the summer; expect it and plan accordingly. Helms are the most important part of your kit. They are heavy, but intentionally so, for a heavy helmet protects your brain. The mass of the helm will protect your brain; the heavier your helmet, the more protective to your brain. If you’re thinking you want a light weight helm, go play another game for your sake and ours. There are few activities that will sort out the practitioners from the posers faster than heavy weapons combat. Check your ego at the door, practice and learn, it’s a worthy endeavor and you will find it enlightening. This IS a martial art. It is strenuous. It is a lot of fun.